Any possibility for a solution for osbo also? Similar to the other comment, is it possible for this to be adapted to the OSPi? Dan-in-CA would have to adapt your C++ code to python in order to send the RF signal based on the “sniffed” RF code correct? Theoretically it can, however, OSPi currently doesn’t have built-in space for RF transmitter, so you will need to solder wires and connect a transmitter yourself. Also, the python program has to be modified to add this functionality. My concern is that because python isn’t very accurate in terms of timing, it may not work because the signal requires pretty accurate timing (down to a tends of microseconds). On the plus side, I am working on porting the Arduino-based OpenSprinkler code to C++ on RPi. I am quite close to be done. 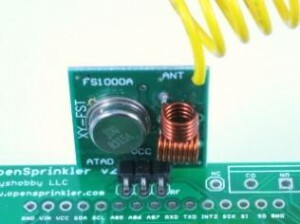 Once this is finished, OSPi can run exactly the same code as the Arduino-based OpenSprinkler, so all the features will be completely compatible (however, you will lose the flexibility of python because to make the program maximally compatible between Arduino and RPi it will have to be written in C++). Hi Ray, I have just purchased OpenSprinkler DC with RFToy and a few other components but I am having an issue controlling my remote power switches. I am using standard RF switches (Status RCS-K09) and the remotes have separate on/off buttons for each of 4 channels. So it seems the signal timing is not being replicated properly. Is this part of the code supposed to be replicated, or is it just fixed to a common value that my switches don’t happen to use, and I would therefore need to modify the firmware to adjust it? Ok looking into this a little more and varying the values supplied in the station name I can see that in every case OpenSprinkler is actually reducing the signal timing to exactly 75% of that supplied. I’m not sure how this value is used, but I’m guessing this might perhaps be to allow for delays in processing or something. For example 012C becomes 00E1, 0100 becomes 00C0, and 00F0 becomes 00B4. However this does seem a little odd, firstly to apply a percentage rather than deduct a fixed known value, and secondly to presumably output a different signal timing code to that actually being effectively emitted. So I’m quietly hoping it’s just a bug. My next step will be to desolder the transmitter from OpenSprinkler and try it in the RFToy hoping this will then send out the code unaltered and my switches will jump to life (should have done this to start with). But I will wait for your response before doing so, as I soldered it on both sides of the pcb and have lost my desoldering gun! The 75% is a scaling factor in the firmware code, it’s pre-calibrated to account for the processing overhead of the microcontroller. Specifically, when you tell it to send a signal of 100 us, the internal processing overhead ended up adding some more, say, 25 us. Therefore it ends up sending a signal of 125 us. Therefore the 75% is used to so that it sends a signal of 75 us, and adding the 25 us overhead, it becomes 100 us in the end. But likely the scaling factor is too aggressive. In that case you can modify the last four digits to counter-act the scaling. For example, you can change the last four digits to 0x190, that way, after scaling by 75% it will become 0x12C, which is the correct timing value. Yup that was it, works perfectly! I think I should try find the upper and lower limits then choose a value in the middle, however 0x190 seems very reliable actually. Ok I tested 4 RF switches (all Status RCS-K09) and found reliable max and min values to be 0x163 and 0x38B. So I simply now use a mid point of 0x277. 1) Provide specific parameter for RF code rather than use station name. 2) Provide parameter to scale RF timing signal. Ideally per station (to support different RF switches in one system). 3) Add simple on off buttons to the manual control rather than duration only (thought I noticed this in some demos). 4) Allow the Additional Start Times repeat frequency to be set in seconds. Would be very useful for testing, demos, and driving things like light and fountain displays. BTW a couple of notes on build quality you might like to know about… The jumper under the LCD on my OpenSprinkler DC had not been bent over out the way properly, resulting in it being forced against a surface mount component on the board and twisting such that the jumper itself had broken. Easily resolved but worth mentioning. Switch 3 on my RFToy is faulty, I often have to press it 10 times to get a response, which means the press and hold becomes infuriatingly difficult to achieve. I wonder if you could send me a spare switch or simply point me to a source in the UK for the component? 1) This has already been incorporated in the upcoming firmware 2.1.6. 2) I am not sure: the timing value is part of the RF code, providing additional scaling just adds more variables and can cause confusion to users and complicate UI design. 3) We made the conscious decision to make the timer value for manual control mandatory — this is to prevent users from unintentionally leaving the station on forever and forget to turn it off. 4) Start times are always in granularity of minutes. Changing it to seconds is not possible for the near future. 2) Understood, but it’s more complicated for users to adjust the signal timing portion of the RF code, than adjust a simple percentage. 3) I suspected as much, but it’s just too restrictive to not allow simple on/off switches. Perhaps you could allow it for RF only. Or perhaps just implement a global safety switch/duration to apply the restriction by default. 4) Understood, I can however see a large market in controlling those dancing water fountain/jet displays with coloured lights. Ok perhaps I should simply start tinkering with the code myself, but I don’t really want to have to repeat changes in each new release, one neat solution might be to implement such restrictions/features as compile time options. I have taken a pic of the jumper should I send it to you via email? Hi Ray, just updated my Opensprinkler DC with latest firmware 2.1.6 this afternoon and I’m getting some very odd behaviour. It looks like the unit is turning off all RF switches on a 45 second cycle? After testing I can confirm no programs running at all, and I can even disable the RF stations, but every 45 seconds the unit sends out an Off signal to each of my RF stations. I only noticed the behaviour this evening when I manually switched on my lights etc via the remote control, and the only way I can stop it from turning off what I manually turn on is to unplug the units power. Is this something that makes any sense to you? Yes, it’s repeatedly sending signals to RF stations to make sure they are in sync. The repeat cycle is about 48 seconds. This is to make sure that the status on the controller matches the actual status of the station. If you want to manually switch on / off your lights, ideally you should use your OpenSprinkler to do so, instead of using a separate remote control. On a related matter I was wondering what changes were made to the RF signal timing and if I should perhaps adjust my signal timing values back to ensure they are still mid range. In other words if you changed the 75% then I probably need to adjust my timing values accordingly. The timing issues have been fixed in firmware 2.1.6. Specifically, it turns out that the 75% scaling is not necessary at all. So firmware 2.1.6 has removed that scaling. Ok so had another read of 2.1.6 release notes and found mention of the periodic re-sending of RF signals to keep them in sync with the controller. I understand the reasoning but feel it is just not practical to assume opensprinkler is the only thing controlling them, and that users will not want or need to manually control their RF switches with their existing remote controls. In effect this feature has now rendered the remote controls useless. Especially when you consider there is no longer a simple on/off switch for stations (only duration). Therefore may I request the ability to enable/disable this sync feature in the next release, perhaps a sync attribute per station or something? Many thanks, Brett. Well, to say ‘this feature has now rendered the remote controls useless’ is a bit harsh. Keeping the remote/RF stations in sync with the controller is particularly requested by some users. For example, if the controller is saying the RF station is on, but the station is actually off, that would cause issues and confusion. Because RF stations do not have feedback (the communication is one way), it’s important to repeatedly send the signal to make sure they are in sync. If you need to switch the RF station manually, can’t you just use OpenSprinkler to do so (instead of use a separate remote control)? Well that’s my point really, if I can only use Opensprinkler to control my switches then the remotes have been made redundant. I understand the need for the sync in certain applications due to no feedback, I just suggest it should be a feature that can be enabled/disabled because some people (like me) still wish to use their remotes to control the switches manually. Actually I find Opensprinkler controls my switches very reliably, so the sync feature doesn’t add anything for me, it just means I can’t use my remotes. Personally I want to use opensprinkler to add scheduling and sensors to my RF switches, but I don’t want it to take absolute exclusive control of them. For example I may have a light which I wish to come on and off through the night on a schedule as a deterrent to burglars, I might also want it to come on during the night when a sensor detects someone is outside, but importantly I still want to be able to quickly switch it on/off as desired during the evening while sat in that room. Similarly I may have a heater that I want to come on when a sensor detects a drop below a certain temperature, perhaps for frost or damp protection, but I still want to override this when sat in that room/garage/shed. Now if I switch my light or heater on using my remote, Opensprinkler simply turns it off within 45 seconds, and if I turn my light or heater off using the remote, Opensprinkler turns it back on within 45 seconds (which might become dangerous in some situations). So instead of simply clicking a button on my remote I have to get my smartphone (or laptop if not using one) launch the interface, find the station, program a duration, and click submit (and that’s assuming my wifi is not playing up). Now if there was a simple on/off switch per station, as there used to be, it would help, but to be honest even then it would still be easier to use the remote. Frustratingly even if I choose to disable the station Opensprinkler still maintains the sync, I have resorted to changing a digit in the RF code to temporarily disable this syncing. Don’t get me wrong I think Opensprinkler is great, but if I could just disable some of these safety features I would consider it fantastic. However I acknowledge it’s probably exactly as required for controlling only sprinklers. All I ask is that you consider adding a sync enable/disable switch, ideally per station, in a future release. Agree with Brett. I don’t want opensprinkler taking exclusive control of my RF stations. I will compile the code and comment out that line. But would be great if there was a field in the GUI to allow this in the future. Also, The video is now out of date, with newer firmwares. You don’t name the station the code anymore. Can name it anything you want. Then change the type to RF and then enter the code. Took me some time troubleshooting to work that out. I re-did the solder, thinking I must of soldered wrong, before I checked out the GUI in more detail and found the new options. Very happy customer here. Loving open sprinkler and ability to control RF stations. That’s great, thanks for the pointer, just the excuse I need to have a play. I got the remote power socket working, no problems there. The only glaring omission for using this as a light controller is that I can’t see how to set a definite “Off” time (eg. I want the light to come on at local sunset, and turn off at 11:00pm)… there is only “duration”. The firmware currently does not support an ‘end’ time. You can only set a start time, and duration (and duration can be from sunset to sunrise). In the next firmware we will consider adding support to define an end time. Can you describe how to convert those timings into the 16 digit code used in opensprinkler? 0=395us on followed by 1250us off. I know the first quad represent the command (on/off), the 2nd quad represent the “channel” and the 3rd quad represent the “socket id”. With the Stanley’s, the Channel # is always the same within a set, and the on/off commands are the same with only the 3rd quad changing. But you already know that. I hope this works. The missing ending 0 is my guess, so it might not be correct. You should check the signal again. Not that I thought it would work, but I plugged that into OpenSprinkler and it didn’t even send a signal 🙂 Any chance of getting variable bits (or in this case bit) remotes working?